Your life is busy. Our life is dogs. In our one-of-a-kind kennel-free Total Immersion dog board and train programs, your dog lives with 2 professional trainers like a member of our family. We provide a 24/7 training experience unlike any other. We go way beyond obedience commands, using our busy home to teach your dog the obedience and practical manners he needs in yours. We named our board and train program “Total Immersion” after intensive foreign language schools where people learn a new language in just a few weeks by speaking it all day every day in real-life settings. Instead of going back to a kennel or daycare after drilling commands in a classroom for an hour or two, your dog learns the exact skills he needs at home and practices those skills all day every day in a safe loving home environment. Dogs learn to stay off counters in our kitchen. They practice polite greetings as staff, guests, and delivery drivers come and go. They learn not to beg at our dinner table. They learn leash walking in our residential neighborhood. They come home ready for real life. There’s nothing else like it. Once we’ve trained your dog, we’ll train you and your family to maintain and build upon your dog’s training. Just like your dog, you’ll learn your part where you need it: in your home for as many lessons as you need. Fill out our our contact form or call 513-779-7829 to get started! When others stop training, we’re just getting started. No other program prepares your dog for life in a busy home like ours. Our Team: Our owners Mel and Jeff Silverman have been training dogs for over 20 years and are nationally recognized leaders in the field. Our trainers and care staff provide an extremely high level of care. From 9am to 9pm, we have 1 person here for every 2-3 dogs and they get lots of one-on–one attention. Meet the team. Our Home: Total Immersion means that our board and train dogs learn practical manners like door greetings, not begging at the table, and staying off the counters in a home like yours. Nearly every room in our house has someone training dogs in it all day long. In-home People Training: We’ll come train your family to maintain your dog’s new behaviors in your home on your schedule. We’re also available by phone, email, or video chat for any support that you need as your dog transitions back into your home. Customized Programs: We start all of our programs with a meet and greet to get to know you and your dog and then design a training plan that’s a perfect fit for your lifestyle. Kid-Friendly: We go beyond formal commands from an adult handler to train practical strategies that help your dog behave for your entire family. 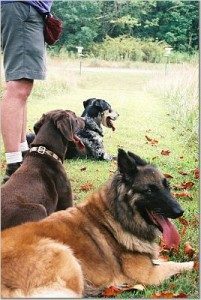 Kids as young as 7 can make excellent dog trainers, and we love teaching them. Lifetime Support: If your training needs a refresher, we’ll be here to help. Our programs include in-home follow up lessons, free classes, and your dog is eligible to board in our home for tune-ups when you travel. We’re Cincinnati’s largest training company and we’ve been in business since 1998, so you know that we’ll be here when you need us. Reliably respond to commands like sit, down, stay, come, and leave-it. We Train You: We’ll bring your dog home and train your family on how to maintain your dog’s wonderful new behaviors. All of our packages include multiple in-home lessons for your family. They also include phone and email support and access to group refresher courses should you need them. 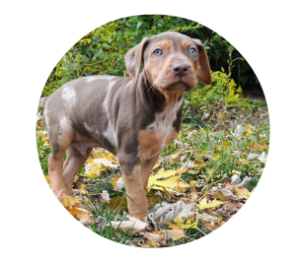 Programs and Pricing: Puppy Camps for Pups Under 5 Months. Because we train in our home and have a high staff to dog ratio, we even take puppies for board and train. Our puppy camps for dogs under 5 months of age include house training, intensive socialization, and developmentally appropriate training to instill good habits right from the start. They also include lots of snuggling and one-on-one attention. Believe or not, once your dog turns 5 months old, he’s a teenager and qualifies for our adult dog training camps. Click here to see details. Board and Train works so quickly because both you and your dog get to learn with a partner who knows what she’s doing. Our owners, Mel and Jeff, decided to start offering board and train after – of all things – taking a dance class. We found that when we tried to learn new steps, we often tripped over each other and could seldom figure out what went wrong. The instructors, however, could take either one of us and teach us to do the step perfectly in just a few seconds. Because the steps were second nature to the instructors and because they had taught hundreds of people to dance, they could stop our mistakes before we made them and make it all seem easy. Dog training, like dancing, is a mechanical skill. When a novice owner and an untrained dog work together, they tend to confuse each other. That slows things down. At Puppy Camp, your dog gets to learn from an expert trainer, who – like our dance instructors – can guide him past any mistake so that he learns very quickly. When it’s your turn to learn the exercises, you get the benefit of working with a dog who already knows what to do. It makes learning faster, easier, and more fun for both of you. We ask a lot from our board and train dogs, but they never seem to mind. We work hard to make them feel like one of the family. We have a 1/2 acre securely fenced back yard for the dogs to play in. We take regular outings to Hueston Woods, friends’ farms, and Uptown Oxford. If the weather’s bad, we do play groups at our training facility just down the street. There’s almost always someone here. It’s even pretty common for one of us to sleep in the guest bedroom with an anxious dog on their first night or two to help ease their transition. Fill out the form below, and one of our owners will call to answer any questions and help you choose the right program for you and your dog. Why Does My Dog Ignore Me? We definitely appreciated your approach to things. You’re a really good communicator. You have a way of expressing concepts that makes the dog’s perspective easier to grasp. Quite honestly, you were the first trainer we talked with that we all felt we could follow, and we’re thrilled with the results.